Make and decorate a gingerbread house this fall to display at the library. Gather your family, co-workers, or grandkids – whoever wants to take on the challenge to build a gingerbread house! No limitations on what you can build, but there is a size limitation – the base cannot be larger than a 12-inch square or 12-inch round cardboard cake base. The height is up to your ability to transport it to the library. Store bought gingerbread house sets make a wonderful starting point for this project! Creators can begin dropping off their gingerbread creation at HPLD on Saturday, November 25. Start planning today! A great family activity to do over the Thanksgiving break. Community Care Systems, Inc., Senior Information Systems Agency for McLean County will be at the Heyworth Public Library on Wednesday, October 25, from 10:00 a.m. to noon to assist people over the age of 60 and the disabled with Information and Assistance in filing for local, state, and federal programs. Their main office is at 616 IAA Drive, Bloomington, IL 61701. CCSI, Senior Information Systems Agency for McLean County can be reached by calling 309-661-6400 or 1-888-322-5712. Walk-ins accepted, no appointments necessary. The 2018 Open Enrollment Period runs from November 1, 2017, to December 15, 2017. The window for enrolling is much shorter than previous years. Plans sold during Open Enrollment start January 1, 2018. You can access this website to research health care options at https://www.healthcare.gov/get-coverage/. 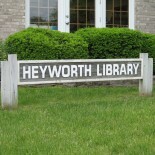 The library offers computers for Heyworth Library cardholders to freely use, as long the cardholder is fine free. Printing is .15 cents for black and white and .50 cents for color prints. The computers are offered for use at $1.00 per hour with a valid state ID or state driver’s license if a cardholder has a fine/fees due to the library or for anyone visiting the area wanting to use a computer. All users under 11 to 18 years old need to have their guardian’s permission on file to use the computers, and students under 11 need to have a guardian supervise them on the computers in the library. October 12 and 19 at 6:15 p.m. This 45 minute program is geared for pre-school through first grade, however, the whole family is welcome to join in on the fun. Come explore, participate in art, and enjoy stories. November 2 at 6:30 p.m. The book, A Separation by Katie Kitamura will be discussed. Copies are available at the library. October 13 at 3:20 p.m.
Movies are shown every Friday the library is open. October 12 and 26 at 6:30 p.m. This group meets on the 2nd and 4th Thursdays of each month at 6:30 p.m.
October 18 at 3:30 p.m. This group meets the 3rd Wednesday of each month at 3:30 pm. Join us for all things Lego! October 26, 3:30 p.m. – 4:30 p.m.
Fun activities are planned for the afternoon. You are invited to also come dressed as your favorite character. October 31, 1 p.m. – 7:30 p.m.
All children in costume will receive a free book and other treats. This entry was posted on October 11, 2017 by Heyworth Public Library District.